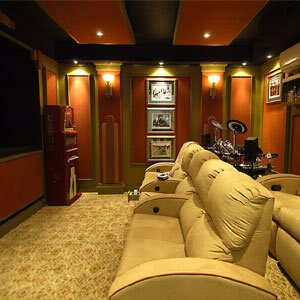 Let WEBCO Install Interior Lighting Control for Your Whole House, Theater Room, or Exterior Lights. 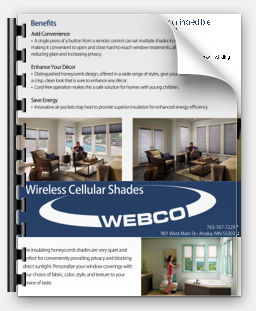 With WEBCO Shade control, at the touch of a button, you can automatically raise and lower shades to reduce heat buildup or add instant privacy! Proper lighting always begins with natural light, from the sun. However this most important resource can also be the most damaging to your furniture, those treasured beautiful Wood floors and even your window treatments. When it comes to winning the battle over the Sun….even with the most “energy efficient” windows expose the interior of your home to powerful UV rays at up to 60% breaking through even the strongest UV barriers. Don’t misunderstand we love a sunny day as much as the next person does but the reality is that unfortunately, the same light we invite into our homes is the very light that damages our investments, while increasing your utility bill often times in an attempt to cool your home or business. Most window treatments are left closed almost all of the time—for privacy, sun control, security purposes or just because they are simply hard to reach and maneuver. In those cases, your windows may as well be walls. With controllable shading systems, you can use your window treatments all the time and enjoy the full range of benefits they have to offer. From simple manual roller and Roman shades to sophisticated systems using Sivoia QE (Quiet Electronic Drive) technology, Lutron custom-manufactures every single shade. You can select from a variety of fabrics with different looks, colors and functionality that meet your needs and style preference for (light-filtering, privacy or blackout). We also feature interior lighting control for your whole house, theater room, or exterior lights to enhance the security and beauty or your home or business. Never walk into a dark house again, imagine at the touch of a button your entry lights could turn on 40%, while your hallway turns on to 60%, and your kitchen is brightened to 85%. No more fumbling for a light switch in the dark. You can have the option to create personal scenes, such as “welcome home”, “good morning”, or “watch a movie”. Each scene controls an area of your home to your custom needs and desires! Just imagine the possibilities; what scene might we be able to create for you today?